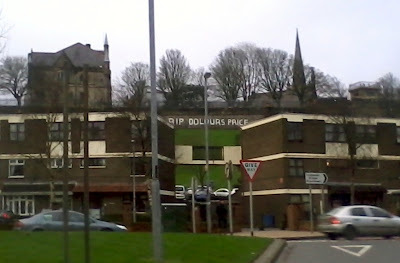 Tonight The Pensive Quill carries a guest article written by my wife, Carrie, on the death of our friend Dolours Price. "If Dolours had a big fault, it was perhaps that she lived out too urgently the ideals to which so many others also purported to be dedicated. "She was a liberator but never managed to liberate herself from those ideas. Sometimes we are imprisoned within ideals; sometimes in war atrocious things are done; sometimes hard things have to be done. "Sometimes it is very difficult to handle the hard things that you felt compelled to do when you are soft-hearted at the core of your being. And Dolours was a soft-hearted person as well as a hard person in her politics." - Eamonn McCann, who was a very close and great friend of Dolours, speaking at her graveside. He described their friendship as a 40 year love affair, and I know she loved him and relied on him for so much. It has been a long few days. I am not even sure how many days it has been, to be honest. Dolours was found late Wednesday night and we were told of her death Thursday morning. I did not sleep that night. I find everything tinged with an incredible sadness. Friday I took the train up to Belfast, and called with friends to the wake house. We returned to their place and they got me incredibly drunk which frankly I needed. I slept away most of Saturday, which was also needed. 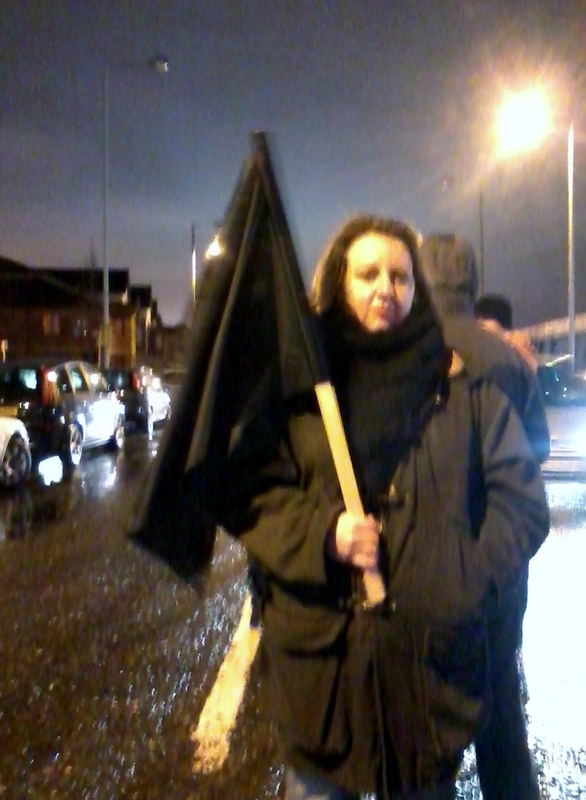 Saturday night we went to the Andytown Road black flag vigil where we stood in the cold, windy air for an hour or so, lined up the length of the road from beyond the leisure centre and past Casement park. We held our flags as they fluttered and cars passed by. Many young people were in attendance, more than I have ever seen in years of white line picket protests. It was sombre, and felt a fitting way to show the solidarity that defined her in that nether world between death and burial. We called briefly into the wake house again, too late to be with Dolours again; she was so near, yet never so far, never to return. Sadness mixed with anger at the frustration of her sister Marian being denied the chance to say goodbye - cruel, unnecessarily heartless; knowing the incredible bond between the two, unimaginable the loss. 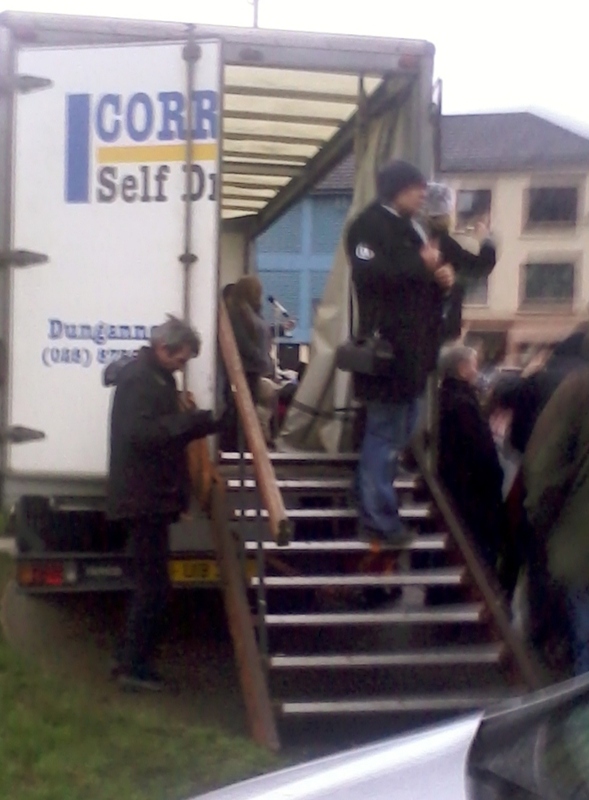 Sunday was a long bus ride up and back to Derry for the Bloody Sunday march. Freezing cold. Bernadette McAliskey spoke. 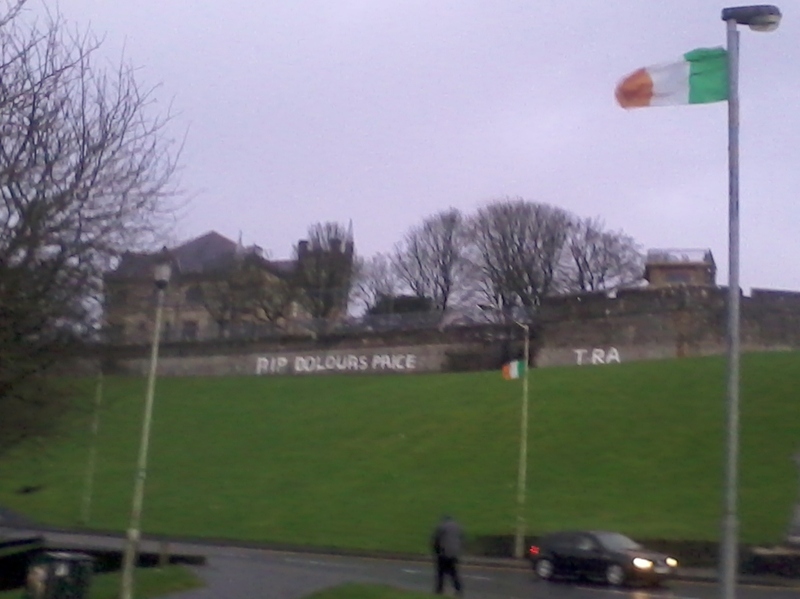 Seeing "RIP DOLOURS PRICE" on Derry's walls brought a bittersweet smile; she would have loved that act of defiance and comradeship, and would have loved being the subject of it. Anger shimmered in the air of the crowd, buzzing with word of Marian's clandestine three-hour visit to the wake-house in the early hours of the morning - at a cost of £150,000, cash, hastily and not easily raised on a Saturday. I can't imagine how lonely Marian must feel now; memories of being denied her mother's funeral, who never did see the two sisters back in Ireland again, crowding with living again in prison, denied the last days of those she loves most. To think about both Marian and Dolours brings an unbearable sadness. More so because it should not be - the women I knew were vibrant women, fighters, feisty, strong; not broken by the burdens they shoulder. These burdens heaped upon them now are too much for any one person, for any family. We called back to the wake house late in the evening upon return from Derry, and my husband and children joined me. My daughter, being older, has more memories of her "Aunty Dodo"; my son was her godson. Too little to remember very much, too young to understand, he was incredulous as he watched his daddy kiss Dolours goodbye, telling me in the car later in a stage whisper, "Daddy kissed a dead body!" with fascinated horror. My daughter is moved by it all. She sees how the loss of her friend is affecting her mother. She holds my hand and inquires how I am feeling, if I am ok, or asks "What's wrong". I squeeze her hand and tell her I am just sad, too sad for words. She tries to hold her own tears in, feeling the grief around her. We call at friends' homes and I am grateful for the small kindnesses shown. The slagging and teasing and the ability to just talk about everything. The shared frustrated outrage. The love. The funeral was today. I held her coffin on my shoulder and thought only of her, why was she gone, why was I carrying her to her grave, how much she struggled and suffered and what an awful way we eventually find peace. The rain was ceaseless, soaking all of us. The Armagh Prison women who formed her guard walked her from her home, to the chapel, to the grave, every step of the way, through every drop of rain. Dolours would have felt she deserved no less, but would have also craved the recognition, the validation: she was a Volunteer; she gave the ultimate sacrifice: her mind, her heart, her soul, her life. 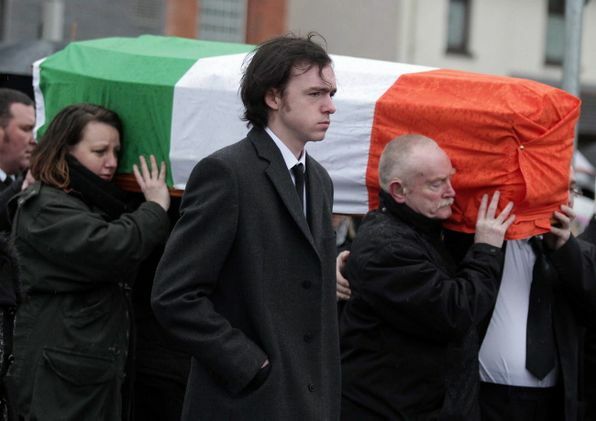 Eamonn McCann and Bernadette McAliskey spoke at her graveside. McCann was a very close friend of Dolours', someone she relied upon greatly. Bernadette has been to the fore in campaigning for Marian. I hope McCann's speech was recorded, or transcribed somewhere; he did her justice. Bernadette's message was frank, and simple: this conflict has been hard. We must embrace our friends, our comrades. Be a friend to each other. Take the time. She is right. We all hurt, we all struggle, we all bear burdens. Reaching out, being there, even for a half hour phone call, or just to say 'Hello - I am thinking of you' - don't let those we know, and maybe even don't know, are hurting, drown in the sorrows they cannot abide, and feel they cannot share. I hugged Bernadette afterwards and introduced her to my daughter. "This is the woman you are named for," I wanted her to know. Take heed, sweetheart, you are part of a tradition of strong women. Learn from them, from Dolours, the strength of your convictions, and from Bernadette, compassion. From both, learn love. A very emotional piece. No doubt hard for Carrie to put pen to paper for this. Such a sad few days. Pickets, wakes, funerals. Will it ever end? I too saw the young people on the road - and at the funeral today. The next generation, I thought to myself, how will it all end for them. My heart was sore today even thinking about that final goodbye taking place and the horrible context it's all in especially that hardships you and your own family have had to bare......thinking a bout you! Stay happy and stay strong!!! Much love to you all!!! Clearly written from the heart Carrie - A poet's heart. Carrie lovely and fitting tribute.there is an undauntable spirit in our women,you know hon they keep knocking them down ,but they just get up again,makes me proud of every one of them..
Itsjustmackers a cara talking to a friend of yours yesterday at the funeral, Collette Mc Cann..
Had to read that a few times to take it in. Amazingly open, honest and emotive. 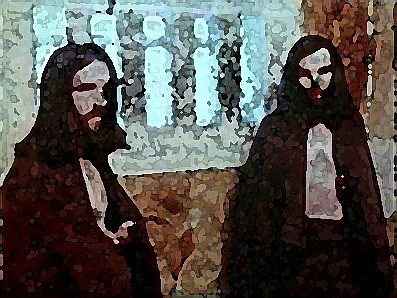 It encapsulates the deep sense of loss when a truely close friend and comrade dies unexpectedly. I saw a few comments about Adams saying Delours recent comments should not demean her life. Gobsmacked at the continuing ego of the man. Raymond McCartney was grovelling to Ford in Stormont yesterday calling for tightened security against organised cross-border crime. Ford 'almost' aforded the 'sham'-ie a wee pat on the head....almost. I sense a watershed after Delours funeral yesterday with SF warned tos to stay away and doing so. It was the day the provos were denuded of any remaining tenuous claim to Irish republicanism. Recent utterings and pro-brit outbursts by SF representatives SHOULD deminish their lives, but doubtlessly wont. Is that the same Collette who's brother "Charlie" with his mate were killed in premature explosion?. The Mc Canns came from Toome originaly but lived in our st, think number was 67. Good God, first frankie then Collette, please give her my best wishes, tell her, Our June,Edward and Renee have died if you see her again, Thanks for that Marty, I really appreciate it. Itsjustmackers a cara its is indeed the very same woman and she hasnt changed all that much,still a lovely woman. "Take heed, sweetheart, you are part of a tradition of strong women. Learn from them, from Dolours, the strength of your convictions, and from Bernadette, compassion. From both, learn love." I've just read you obituary or article and I wept. It is a gut-wrenching piece of writing, up there with the best of them, the best I've ever read. Devastatingly powerful yet never strident, just so humane and tender, and because it is so comprehensive of your feelings and your relationship with Dolours it's highly worthy of inclusion in any assessment of the IRA struggle that Dolours was engaged in, especially given the grief you were enduring while composing it. I gave up yesterday. You didn't. Just as Marty Cunningham said should be the case. And as you quoted Bernadette it's fair to say your words are up there with the best Bernie has ever enunciated, and Bernadette can talk. It's up there with the best of them. Ps, if you're ever doing a writing course Carrie, I reserve my place on it here and now. A credit to you and to your pal. "[...] Former women comrades from jail flanked the Tricolour-draped coffin throughout the funeral procession. Could it be that those who would have willingly labelled Dolours 'a tout' are worried by the fact that Former Comrades chose to publicly display their respect for her? Yes, the whole family were beautiful. Please tell her our Anthony and Martin now live in Ballycastle,were my mother and father are buried, with wee dessie ,Paddy lives down south in England, Theresa lives in lacashire. I remember Mrs Mc Cann (RIP) chasing me away from her door for singing to loud, it was before, Myself, Charlie (RIP) and Larry Donavon (Callaghan) No 54 were going to the Boom Boom Rooms and Charlie was just getting ready, He had a lot of plaster to bathe away. Memories are Golden, My sincere regards to Collette and Family, and what about Brian (potential of a GAA player , and Rosemary, now I'm sure there was three girls and Three Boys, I think the youngest boy was Joseph, who knocked about with our Anthony ,but I cant remember the other girls name, the auld memory is not that good anymore, but it just brings someone to mention a name and things spring back to Life, or, Partially to life. I appreciate that info Marty. Thank you so muchThat has made my day. It must irritate such peopleto realise that Dolours wasn't for sale. More importantly she could laugh at herself at times. Marian isn't for sale. In fact none of us who were there yesterday, and thousands besides who would have been there if they could are for sale. Bernadette hasn't been bought off. 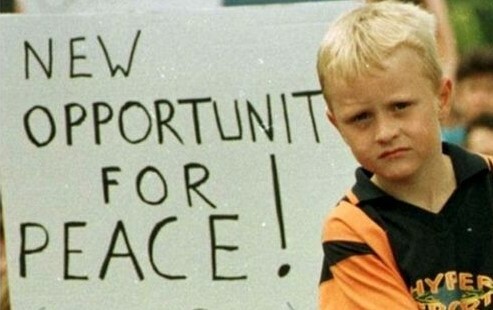 Nor McCann.Thtas because they have had a consitent vision of what was woth fighting for. The conscience of this struggle may have flickered weakly at times but it hasn't gone out. If anything the flame is becoming stronger, as the 5,000 plus people who took part in the Bloody Sunday March in Derry clearly demonstrates. This is significant because the mobilisation was acheived in the face of hostile and active oppostion from Sinn Fein and their entourage. More and more people realise that when in comes to the working out of the Belfast Agreement the Emperor very clearly has no clothes. Clearly Sinn Fein are less than happy with the growing number of people who are prepared to stand up to them and say, we no longer need your approval to organise, to agitate to educate. We no longer believe that you have any real alternative to what is. You have speaking out of both sides of your mouth for so long you are in danger of beginning to believe your own half truths. Yesterday both Eamon and Bernadette spoke the language of the heart. Which at the end of the day is the language of revolution. The language of a struggle for something completley different, the struggle for a society worth fighting for. It might not be popular amongst those who whine on about the limitations of 'real-politique.' But it was this language that moved a generation of us, to take to the streets to do whatever we felt we had to do to,including risking imprisonment and even death in order that we might lay the foundations for the construction of a better society. A society free from greed and avarice, based on solidarity. A society that would celebrate divesity whilst promoting culture and the arts. 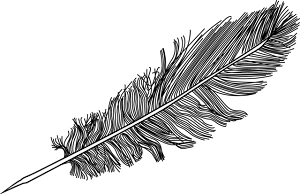 A society based on equality and the equal distrubution of resources. This was Dolours's vision. A revolutionary vision. A vision based on love. That's how we will remember her, this is the memory of Dolours we will hold her memory close to our hearts. Stay free brothers and sisters there'll be another day. Venceramos! A poignant yet humble and humane eulogy. Such strength in the face of such adversity in her life...how weak I am. Who will replace the pillars of Irish Republicanism as they slowly crumble to the grave? Freedom will come some day. When all the oppressors are gone and we the People have risen. Stand tall and don't let them attack our ideals, for we are right and will not be beaten. Itsjustmacker; did you write this? I've never come across it before. Yes I penned it as a tribute. A fitting and touching tribute for a woman who is still an inspiration and shall never be forgotten. On a personal note how are you fairing I hope well? It is strange how memory at times is not so reliable it didn’t seem as if a year had already past and when I returned to Carries heartfelt Rest In Peace I was a little confused as I read through the comments. I remembered the poignant tribute from Carrie and remembered I had penned a comment then became unsure if I did as I didn’t see it here. I took a few minutes glancing through my TPQ notes and found the comment although came up blank as to why I never posted it. Though a year on it seems more significant I remember my phone ringing though couldn’t say what time it was morning noon or night as the voice on the other end struggle through the pain and tears to tell me that Dolours had died. It took more than a few minutes to even begin to come to terms with the terrible sad news. My initial thoughts were of her family and how devastating the sad news would be for her sister still in disbelief as it seemed so surreal. I can’t recall the duration of the call all I could do is listen and offer a few words of consolation which I understood at the time that my words couldn’t even scratch the surface of my friend’s grief. A year on and in a sense I can begin to understand why my friend was overwhelmed with grief during the conversation the image of Dolours the republican icon gave way to Dolours the person. Republicanism had lost a dedicated inspirational woman a great comrade and without doubt a woman who put Irish freedom first and history will remember her for her sacrifice and dedication. My friends spoke of her in much the same way an inspiration a loyal friend an ordinary woman with an extraordinary heart. Looking back I feel privileged that my friend shared some personal happy moments about Dolours the person and I hope it is those memories that will prevail on that long road of grief and personal loss.